Four of my grandchildren are currently taking lessons at Creative Soul. We all love the atmosphere and the professionalism of the teaching staff and the desk attendants. Each of them look forward to their lesson day. They are taking voice, piano (2), violin and drums. We take every opportunity to brag about the quality of service they receive. Count it all JOY! 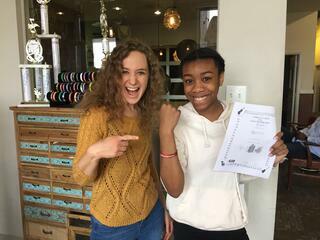 We love Creative Soul Music School! My daughter enjoys her lessons and especially likes the opportunity to perform at recitals! This most recent at Bass Hall was fabulous!!! "My Son Can't wait for his lesson...." My 8 year old son takes piano lessons from Creative Soul School of Modern Music and LOVES it! He "practices" all week the new song he learned at his lesson. His teacher Lisa is wonderful. She understands how he learns and so he is successful in learning how to play. No scales, no boring practice sheets, only fun songs to play! My 2 year old wants to go to music school just like his big brother because he sees how much fun it is." "Creative Soul School is the best!" Both of my girls love Creative Soul. We are in our second year and my daughters have learned more than just how to play piano - they are learning how to make music. The teachers there are amazing." "My son is 8 years old. He has been taking piano lessons at Creative Soul for 2 years, and loves it. He picks the songs he wants to learn and they teach him to play by ear and by reading the music. The teachers are great with the kids and make learning fun!" "Amazing experience!!" My band is in our second semester of lessons from Creative Soul. We take lessons from Ben. He is a very good teacher. We are having so much fun. We get to choose our music that we play so that we are into the lessons. We 2 songs last semester and we have learned 3 this semester. They are all current popular songs. At the end of every semester, your band plays at a local venue. Last performance was at The Door and this semester we are playing at Kellerfest!! No matter what else is going on, my family will stay with Creative Soul Music School. Thank you Creative Soul!! "This place rocks the burbs!" 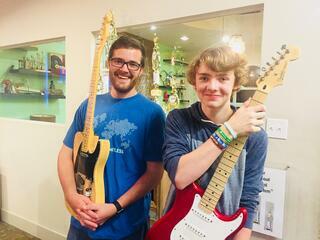 My son wanted to take guitar, so we inquired with the talented musicians at Creative Soul. They based their approach on my son's musical interests, goals, and current skills. 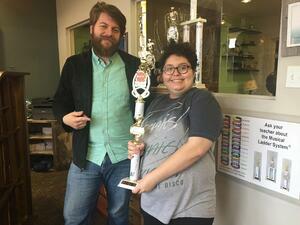 After 6 months with a one-on-one instructor, he was ready to progress to "Rock Band." Now he practices with his "band" an hour a week to prepare for "concerts" (recitals). He feels like he's part of a true group, they keep each other motivated to do well, and his confidence has increased as well. 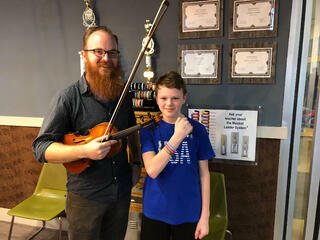 This is a great place if you want a progressive approach to learning an instrument." "Best around! Creative Soul has the nicest people working for them! My son loves his guitar teacher so much! I could never get him to practice with his old teacher and now he plays all the time! I can't believe it! Now he wants to join one of their rock bands.."
"Last day of rock camp today; our son declared it was the BEST camp he has ever been to (and he has been to a lot)! He was so jazzed after the "graduation" concert this afternoon! So much fun to listen and watch the camp musicians perform!! "Rock Camp is equivalent to 3 months of private lessons in one week!" 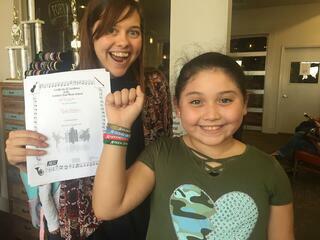 "Rock and Roll!This school is amazing, I'm going there for their rock camp an I love it! It is the most fun i have had when it comes to music. I recommend this music school to anybody that likes music, or likes to play any instrument!" 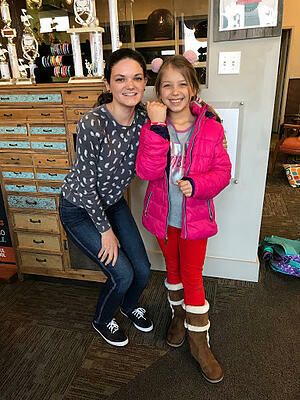 "I attended the Rock Camp at Creative Soul 2 years ago. I will never forget the experience that I had there. You learn so much in that one week. We had shirts with our band and CDs too. Being around Musicians that care and want you to enjoy the experience of learning your instrument was a great joy." "Not your traditional classical music lesson. 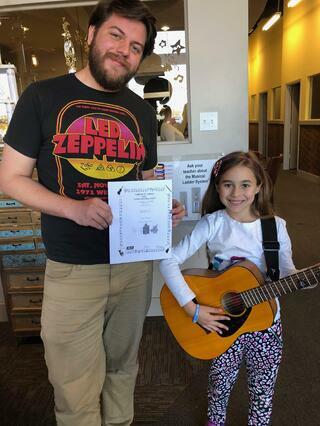 My 10 year old daughter and I take guitar lessons at the Creative Soul School of Modern Music. She also takes piano lessons from a wonderful lady who focuses on classical music. She loves both lessons, but I will admit that she practices her guitar with much more enthusiasm than her piano. One of the key reasons I believe is that she gets to help select the music that we learn. That makes practicing at home that much more fun for her. I have had the pleasure to meeting and working with several of the instructors and they have all been wonderful teachers and they have a genuine desire to help all their students succeed, even an old fart like me."